Not so long ago, I was working as a programming analyst for a banking client of an MNC in India. Every day at my office, I heard people talking about how they could make money from cryptocurrencies like Bitcoin. But at that time, I didn’t know what the heck Bitcoin or cryptocurrencies were! Like most people, I got to know about Bitcoin from a friend. At first, I ignored him and didn’t pay that much attention (mostly because I thought it was some sort of Ponzi scheme). A few weeks later, I heard the Bitcoin noise again in my office, and my same friend approached to me to invest in a Bitcoin-like cryptocurrency (Swiscoin – which was an obvious scam). Thankfully, I didn’t invest, but I did do some research on this coin. It was from this research that I got to know about Bitcoin – the world’s first fully functional cryptocurrency. On the way, I discovered many other cryptocurrencies also like Namecoin, Dogecoin, Dash, etc. That’s when I started researching and self-studying as much as I could about Bitcoin and the cryptocurrency world as a whole. From cryptocurrencies, I got introduced to a new buzz word – Blockchain. I continued my crypto information quest after my office hours late at night. Slowly and steadily, I understood the novel invention of blockchain-based digital money, and I started appreciating it more each day. I had already learned that Swiscoin was a scam, but that initial trigger of Swiscoin brought me to this world of Bitcoin, cryptocurrencies, and the blockchain. And as you all know, I now work full-time at CoinSutra. Since my first encounter with cryptocurrencies, I have grown leaps and bounds. I have read quite a few books on cryptos and the blockchain (like Mastering Bitcoin and Blockchain Revolution), and I have also invested in many cryptocurrencies. All this while, I faced a big challenge of getting my hands on good resources to teach myself about the subject of cryptos and blockchain technology. And if you are like me, then you too are finding very few places where you can get the information required to understand the cryptocurrency and the blockchain world. That’s why today I am publishing a list of resources where you can find all the things you need to teach yourself about blockchain technology and cryptocurrencies (including certification courses). This list will also answer my friends who keep asking me on Quora how to get involved/get started with cryptocurrencies and blockchain tech. Moreover, all around the world, there is a surge in demand for people who understand blockchain tech and cryptocurrencies. It doesn’t matter whether you are a developer, writer, designer, or a layman, you still can be part of this blockchain and Bitcoin revolution! This is the first free cryptocurrency MOOC. Presented by the University of Nicosia, the course is taught by leaders of the industry like Andreas Antonopoulos and Antonis Polemitis. It extensively covers Bitcoin and other currencies from an economic, legal, financial, and social perspective in 12 MOOC sessions. Moreover, students who take this MOOC and successfully pass the assessment at the end will get extra credits. These credits can later help them secure admission in the world’s first MSc in Digital Currency degree program, if they are interested. Here, students can even pay their tuition fee in bitcoins and get their self-verifiable certificate on the Bitcoin blockchain. This is one of the best free courses available in the market, but it has no certification award. It was originally designed for Standford University students, and there are lecture notes accessible for people like us who want to dwell in the world of blockchain and cryptocurrencies. The contents of the course cover aspects of cryptocurrencies like Bitcoin, smart contracts, distributed ledger technologies, and consensus systems. To narrow down the vast subject of cryptos, they have only taken the case studies of Bitcoin and Ethereum. This course is brought to you by Princeton University via Coursera. It is also a free course comprising of 11 weeks of online material, but it has no certification award. The course covers things like: How does Bitcoin work? What makes Bitcoin different? How secure are your bitcoins? How anonymous are Bitcoin users? What determines the price of Bitcoin? Can cryptocurrencies be regulated? What might the future hold? Etc. It has 12 lecture videos and 11 lecture slides that are also free. While this course was meant for Princeton students during the Spring 2015 semester, its information is still very much valid for today’s crypto world. If you are a developer and are already accustomed with Bitcoin and cryptocurrencies, then this course is for you. IBM Blockchain 101: Quick-Start Guide aims to teach developers how to deploy a blockchain network and start coding on Hyperledger. In my opinion, it is one of the most extensively taught courses on blockchain tech anywhere on the internet. It’s taught by developers and for developers who are interested in public or private blockchains and distributed ledger technologies. This is a free presentation slide course for beginners on blockchain technology. It has four parts to it, and it can be taken anytime anywhere without any registration. It’s presented by Blockstrap, a company that makes web APIs for developers to get involved with the blockchain. Blockstrap’s APIs have been tested on Bitcoin, Litecoin, Dogecoin, and Dash, as they are chain agonistic. This Bitcoin basics course is brought to you by Khan Academy, which is an avid proponent of free online education. I have personally used this course and found it to be very useful. The course comprises of 9 extensive videos that talk about Bitcoin, the Bitcoin blockchain, Bitcoin transactions, POW consensus mechanisms, etc. This is a free, online, self-paced, intro-level course on Bitcoin and the blockchain. It has 7 short videos that altogether take about one hour to watch. In this introductory course, you should expect an understanding of Bitcoin, the blockchain, and the future of this incredible revolution in currency and decentralized technology. This is also a free course presented by Cognitive Class, an IBM community initiative. They provide free online courses on various topics and call it an “@Your Pace, @Your Place education system”. This Bitcoin and blockchain basic course has 4 modules that will last for 4 hours in total. Expect to learn about the Bitcoin basics, blockchain networks, cyber-economics, and the political implications of this emerging technology. So you must have heard about the revolutionary cryptocurrency Ethereum, right? If you are interested in knowing more and learning the under-the-hood technology of the Ethereum blockchain, then you should take this free course. Expect an introduction on blockchain technology with a focus in Ethereum. This course will also teach you about the concepts underlying the blockchain and distributed ledger technologies. It will also introduce you to how Ethereum works and how you can get involved. This course was previously known as “IBM blockchain for developers.” But this course is not only for developers as it will help anyone interested in blockchain technology to understand and explore its use cases. It is a 2-hour, online, self-paced course where if you successfully pass the assessment, you will get an IBM-issued and IBM-recognized badge. Another free resource that you can use is the YouTube channel of Andreas Antonopoulos. If you are a beginner in the blockchain and cryptocurrency world, then this is one of the best places to start. I myself have used this resource for detailed insights on Bitcoin, Ethereum, and blockchain technologies many times in the past. Andreas is a computer security expert and technologist who has become one of the most well-known and well-respected figures in Bitcoin. He is also the renowned author of some popular books such as Mastering Bitcoin: Unlocking Digital Cryptocurrencies and Mastering Ethereum: Building Smart Contracts and Dapps. CoinSutra is one of the fastest growing cryptocurrency communities in the world. 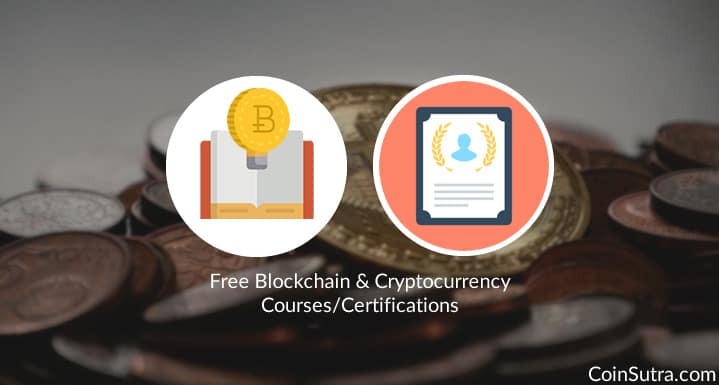 We don’t provide courses or certifications, but we equip you with enough information to get started using Bitcoin, other cryptos, and the blockchain. I, along with Harsh Agrawal (the founder of CoinSutra), aim to disseminate the best practices of this new crypto world to the many readers of this blog! So that’s all from my side in this article. I will be updating this mega list of resources regularly, so keep an eye here on CoinSutra. If you know of a great online course, put it here in the comments below! We welcome you all to become a part of this growing community! Thanks for your contribution. This resource seems genuine will list it too with your citation. what are prerequisite needed to learn this technology. I have good knowledge in Programming skills and working as a Mean stack developer. Just get started and learn as much you can. Still, if you want to learn and feel blockchain then no better option than buying Bitcoin and Ethereum in some amount and playing with them. Cheers @Sophia. Yeah, let’s educate ourselves and other about this tech otherwise it not go very far. @sudhir, myself abhishek from kolkata, I have been serving as an ETL developer in a renowned MNC for the last 2 yeras 10 months. Sp, by learning blockchain online, how much will it will be beneficial for my career? Mean to say, industry is always seeking for experienced candidates. As the blockchain is new on the tech plate,So many mnce has not been adopted it properly. So how does this online learning experience will matter ? Yeah, if you want to make a move into blockchain then this should help as this space has a dearth of blockchain competent people. And no one is waiting for MNCs to adopt it. I am a junior banking professional in credit/finance division, who would like to gain knowledge/expertise in Blockchain technology. But I do not have a software coding background or programming knowledge and has experience only in bank transaction processing and monitoring. 1. Will it be beneficial for me to learn Blockchain technology in terms of its implementation(not programming) and final usage? 2. If yes, which online course/certification will you recommend to get into, that will help my career progression in any way?? 1) Of course, it will be useful if you are looking to consult blockchain based payment start-ups. I was reading your article and though that maybe Bitdegree could enter your list one day. Have you heard about this platform? For now they have only several courses on crypto&blockchain, but I personally was reading their blogs about cryptocurrency investment and it really helped me to get a better understanding on how it works. Moreover, their platform is based on the blockchain so I believe that they should definitely release more courses about this topic. It is just a suggestion for you as it seems that they have a lot of potential. Of course, I know but I haven’t seen it that deeply. Moreover, why you need a token for that?? As far as I understand, tokens will be paid as incentives for completing the courses. Also, companies, who look for employees with certain skills, will be able to release courses which provide the knowledge needed for the position and thus, offer token scholarships for students who complete this courses. Nothing in the above list specific to real estate but you can google some real estate based blockchains to enhance your outlook, their whitepaper will help. Hey Sudhir , excellent article. Really good for all starters. Also can you recommend some certifications which are highly recognized in the industry paid or otherwise. This will help candidates who are looking at making a career in this space.